Shortcuts Fixer provides you with a convenient way to address these invalid shortcuts. By scanning your system, it finds all the invalid shortcuts and reports back to you so that you can remove it from your system or fix it by update the shortcut with the new information. 1. The First Line Buttons: quick access button to "Quick Scan", "Advanced Scan", "Fix Shortcut" or "Delete" function. 2. The Lower box: displays you a list of all broken shortcuts and references with some information: its name, target, location and more. When you click Advanced Scan button, you will find there are two options for scanning for invalid shortcuts. After configuring the searching options, click 'Scan now'. 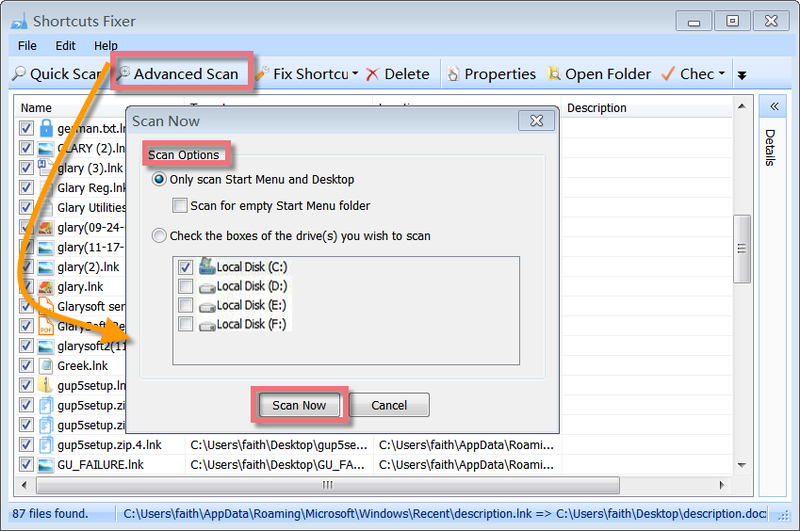 You can cancel the scanning process by pressing the 'Cancel' button or pressing 'Esc' Key. Shortcuts are links to files stored in different folders and drives on your PC hard-disk. Your Windows Start Menu is comprised of shortcuts pointing to various files elsewhere on your hard drives. Double clicking (or otherwise invoking) a shortcut automatically opens its corresponding application or document. Sometimes, the "targets" of these shortcuts are moved or deleted, leaving the shortcut pointing to a file or location that no longer exists. Such 'dead' shortcuts clutter your Start Menu and Desktop. After the analysis, Shortcuts Fixer displays a list of all invalid shortcuts. 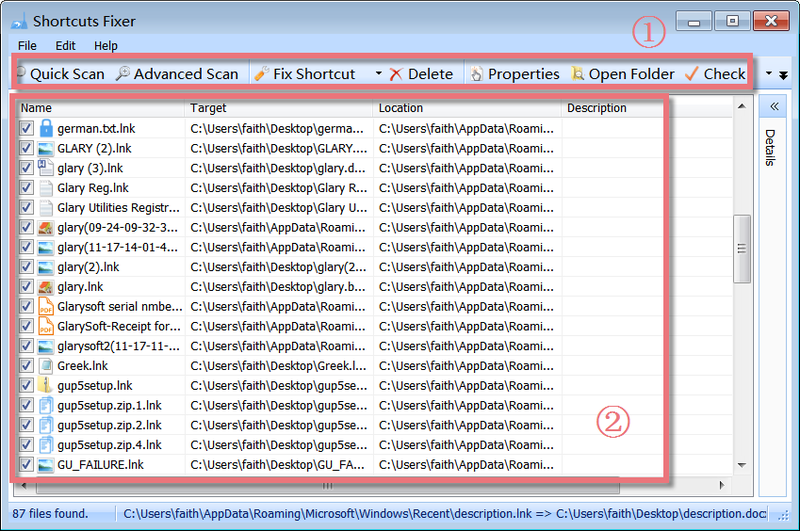 Select the files and right click on them to see the context menu. 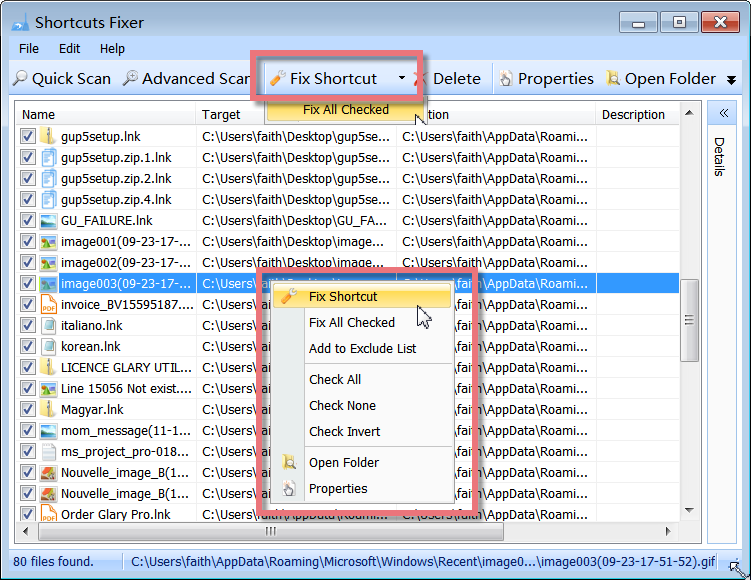 Click 'Fix Shortcut' to browse and select a new target file, Shortcuts Fixer will fix the broken link for you. After the scanning is complete, you will be presented with a list of invalid links found. 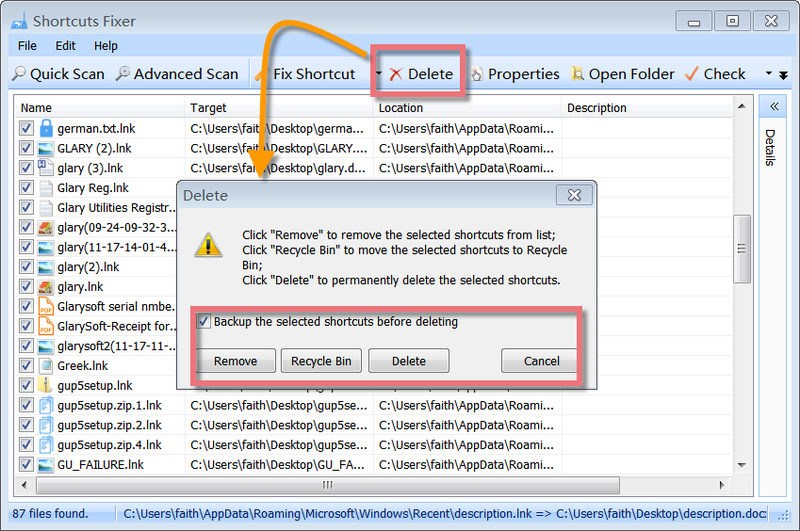 If some point to files that no longer exist or which have been moved, you can remove them. You can select those files that you want to delete by check marking them. By default, all links found are marked for deletion and you can choose to backup the selected shortcuts before deleting. Click 'Delete' to permanently delete the selected shortcuts. In case you have deleted some invalid shortcuts mistakenly, you can restore them with a few clicks. When you decide to remove the invalid shortcuts, by default, Shortcuts Fixer will backup the selected shortcuts before deleting. You can restore the deleted shortcuts by click Restore button, and a small window will pop up. 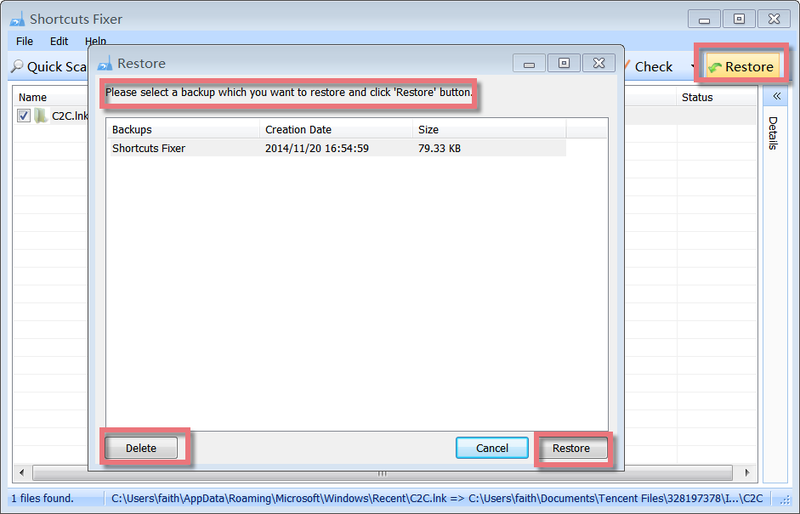 Here you can choose to delete the backup completely or to restore it according to its creation date and the size. Click "Remove broken shortcuts" under Disk Space, Shortcuts Fixer will pop up. Find and click Shortcuts Fixer icon, Shortcuts Fixer will appear. Please note: if you want to add Shortcuts Fixer in the Dock bar, click in Dock bar, remove any icon by dragging it out of the Dock firstly, and then drag Shortcuts Fixer in.